Switzerland risked a jumping in at the deep end on Tuesday. Deviating from the agenda, Federal Councillor Didier Burkhalter confronted participants at the Seoul Nuclear Security Summit with his call for nuclear disarmament. Burkhalter emphasized that if the risk of nuclear terrorism was to be minimized – the official aim of the summit – it was necessary “to do everything possible to reduce the sources of such an act”, namely to cut down the number of nuclear warheads and weapons capable material. Switzerland’s foreign minister has a point. Even though the New START treaty marks a step towards the vision of a world free of nuclear weapons, there are still far too many warheads around. For years, Swiss diplomats have tried to keep the debate on nuclear disarmament running and have pushed projects and international initiatives. Switzerland leads by example: it has ratified all multilateral disarmament agreements open to it and plays an active part in the work of multilateral bodies related to arms control and disarmament. However, the country has not always advocated nuclear disarmament. In fact, until the 1960s, Switzerland followed quite the opposite course with its nuclear weapons program. Only after the Cold War it fully embraced a multilateralist approach to disarmament. All this became apparent during a lecture on Swiss security policy, held on 22 March 2012 at the University of Zurich. As a reaction to the nuclear armament of the US and the Soviet Union, nuclear weapons were vividly debated in Switzerland during the 1960s. A heated discussion started when in parliament the question was posed whether the army should be equipped with nuclear weapons in order to protect Switzerland’s neutrality and independence. Many politicians rejected ethical concerns and argued that military considerations should prevail. In 1962, however, the Swiss people turned the bill down and ideas for a nuclear weapons program had to be abandoned. Fears of a nuclear attack remained. The nuclear non-proliferation treaty was signed a few years after the vote, in 1968, but disarmament was only hypothetical. Rather, the US and the USSR competed for nuclear primacy. Intermediate-range missiles were launched and missile defense systems were set up. The rising tensions between the two blocks led Switzerland to conduct a progress report on security policy in 1979. The report concluded that nuclear weapons grew politically more important and remained a serious threat to global and especially Swiss security. As a result, the government announced a policy of dissuasion and resistance, of which the nuclear shelters – built into almost every house – became the symbol. Preparations for an invasion by Soviet troops were started and the army re-inforced. Strategic thinking was trained and the population was educated in civil defense. When the Cold War ended, the Swiss government carried out a new report in 1990. The angle of security policy was widened to include European security. The government recognized that Swiss security depended more and more on European security. The point of view was shifted from building up resistance to strengthening trust and cooperation. The potential of nuclear proliferation in the Third World was qualified as a new threat, which should be countered by joint European efforts. The report pleaded for a stronger nuclear weapons control as well as disarmament and pointed out the importance of international cooperation. Switzerland started to support international measures for nuclear disarmament and to participate in the OSCE process for arms control and disarmament. Ten years later, in 2000, cooperation was qualified as crucial for managing future threats and in order to adapt to the recent geopolitical changes and the new global security situation. Switzerland became active in various multilateral organizations and signed agreements for arms control and nuclear weapons disarmament. The country also got involved in promoting transparency concerning military actions conducted by other states. Switzerland finally managed to include international humanitarian law in the nuclear disarmament debate which is seen as a further step in delegitimizing nuclear weapons. Switzerland has recognized, albeit reluctantly, that only through cooperation and multilateral engagement can security be guaranteed. The nuclear threat has changed, too, now emanating from terrorist rather than from hostile states. Therefore measures had to change – resistance and dissuasion are useless principles today. With its engagement for eliminating nuclear weapons, Switzerland shows how important it deems international cooperation to be. The support of nuclear disarmament becomes more efficient and the implementation of projects is carried out more easily as the example of Switzerland’s participation in the Global Partnership against the proliferation of weapons of mass destruction shows. 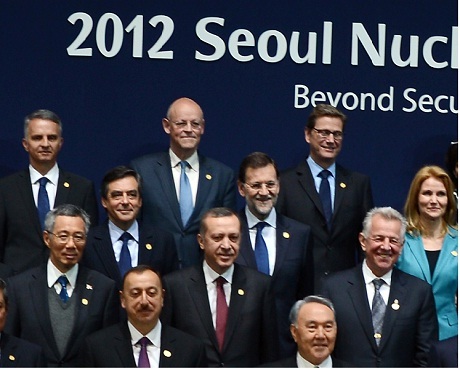 And Switzerland’s advocacy for nuclear disarmament at the Seoul Nuclear Security Summit marks a further step in pushing for a nuclear free world. For further information on the topic, see our keyword Nuclear Weapons Disarmament.